August 13, 2010 Christian Stangl called his home team in Austria from K2 BC and said he just got back from a successful, 70-hour long summit push. The team reported that Christian had topped-out at 10AM on August 12, snapped a few pics and started descent. 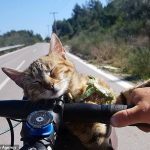 On the way down, he had dozed under a rocky shelter during the night. ExWeb asked Christian's team for a summit pic, which was submitted within hours, together with a brief report, in which Christian spoke of tough conditions with snow (except on the push from C3 although the sky was overcast again at arrival on top) and falling rocks. On descent, he estatedly separated from the Abruzzi route on several occcasions due to soaked and frozen ropes. Since the summit image (a self-portrait of an unrecognizable person on seemingly K2 summit) was not clear enough, ExWeb asked the sky-runner's team for further details, images and GPS checkpoints, which they immediately agreed to submit upon Stangl's return home. Christian didn't linger in BC after his success. He left already by Saturday, August 14. Sunday, Kazakh Maxut Zhumayev questioned the summit on his website. Max voiced the collective suspicions raised among the remaining BC climbers. In a report, Max praises (ironically?) the amazing capacity to solo the mountain in two days after so many other climbers had worked on the routes for weeks in vain. Then, in a comment below, he openly questions Christian's claim, since "no one returning from the Abruzzi route has seen his shoe prints, marks of the ropes being used, and his belongings in C2 and C3 remain untouched," and calls such behavior an insult to Fredrik Ericsson's memory, "who died here fighting a fair battle on the mountain." In fact, all doubts sprung from Gheorghe (George) Dijmarescu, leading a team comprising his wife Lakpa, Christian, a group of Nepal Sherpas and Romanian climber Zsolt Torok, who describes a very tense environment during the expedition. 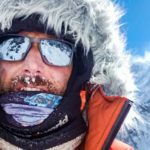 "Gheorghe Dijmarescu stood back and just made criticism and comments during the whole expedition, obviously he did not want to climb," Torok stated. 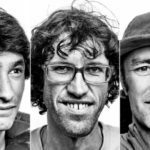 "As usual, he tagged all of them [climbers] as stupid, regardless their experience. Dijmarescu was afraid of K2, I could see that. The Sherpas (led by Gheorghe's wife Lakpa), at one of Dijmarescus hysterical outbreak, definitely wanted to go down and said that they didnt even want their money." Torok also stated that, "Gheorghe tried to persuade the whole group not to climb, so that Christian told me he would climb alone. He left for ABC in the afternoon, planning to sleep there, then go for C3 and from there, to the top. He didn't bring a walkie-talkie because it was to heavy, he said." Zsolt Torok wrote that he, Gheorghe and his wife (Lakpa) started an ascent from BC on the 13th of August, at 1AM. Gheorghe and Lakpa slept in ABC. "Surprised, they said that Christian had not slept there," Torok wrote and continued his report: "I climbed to C1 and I saw that nobody had climbed there before me. I climbed to C2 and in the House Chimney I understood that it was impossible that Chris had been there, because everything was covered with ice. The Sherpas said that there were no traces in front of me." "C2 was untouched," Zsolt explained. "The Sherpas climbed to C3 and found that nobody was there. Chris ice axes were there just as he left them and the tent was also packed." "To climb directly to C3 is an inhuman effort and difficult; from there to C4 the snow is up to waist--not even the Sherpas were able to reach C4. We started four people in an attempt to reach C4, but we were stopped because of the bad weather." 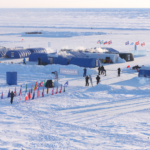 "He couldn't have gone up the Cesen route either, since the Poles and Kazakhs were there and would have known," Zsolt reflected. "After a few days, the Pakistani porters found his sleeping bag, tent, ice axe, food, a pot, a sleeping pad, and what is most important, a 370-page book written by an Austrian writer. A walkie-talkie was too hard to carry, but he took a book with 370 pages. Could he probably have considered that for K2, even two days being too much, so that he might even read if the climb is too boring? The fact is that these materials were well hidden under rocks, away from ABC. Another question is, except all (C2, C3, Abruzzi), how did he climb the Bottleneck without ice axes and without rope?" Days later, all BC climbers met up in Pakistan Alpine Club HQ's for a joint debrief session, led by Dijmarescu. They expressed their disbilief at Christian's claim, and the PAC's crew decided to deny Christian a summit certificate, ExWeb Pakistan correspondent Karrar Haidri reported. "They didn't submit any proof for not acknowledging the summit by Christian," Karrar noted, and explained that Stangl was already on his way home. Gheorghe refused to speak to Karrar since he was related to ExplorersWeb. 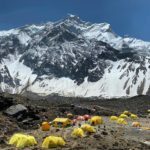 Editor's Note: Dijmarescu recently apologized in a post on EverestNews for describing porters as "f***ing Pakistanis" in a previous report. (Link on the left). As in the case of Oh Eun-Sun, the staff and contributors at ExplorersWeb/AdventureStats work in the presumption of innocence. Climbers are believed unless serious facts speak against them and/or they have a history of deceit. To our knowledge, Stangl has not previously been accused of false claims. 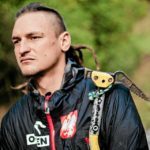 Dijmarescu, on the contrary, was photographed beating his wife and his wife's teenage sister on Everest BC some years ago. After ExWeb published the images, Gheorghe reacted by emailing death threats to ExWeb's crew. 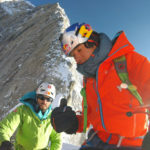 Later reports such as the above by Romanian climber Zsolt Torok and Gheorghe's own description of the Pakistani climbers indicate that little has changed and there is no reason to trust Dijmarescu's unbridled fits of temper. 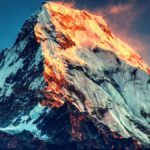 Yet with the multiple attacks on Stangl's claim including some very valid points, ExWeb asked Christian once again for solid evidence such as a raw summit image (to remove suspicions of manipulation) and the GPS data, both apparently easily available. We also offered the climber to meet the accusations. "I knew that there would be a story like this, I already was informed by Gheorghe Dijmarescu in an email a couple of days ago," he wrote to us. "There have been several quarrels with Gheorghe all this time. He called all climbers liars and blamed others for Fredrik Ericsson's death. He fought with his wife Lakpa, also with the Sherpas and Zsolt. I stopped all activities together with Gheorghe and 'his team' after a summit bid on August 6, " Christian confirmed. "I left Base Camp on August 10. Then I went to ABC and slept there until midnight--I wanted to climb these sections during the night to avoid rock falling. Before starting at midnight I stored all my gear outside the ABC camp, in order to prevent it from being swept by an avalanche." "I made it all the way up to C3--C1 was not in existence anymore and I skipped C2. The route was very good, on hard snow or rock. There were tracks of older ascents. During night time there was light snowfall. In C3 the weather was still poor but cleared up during late afternoon. I rested for about ten hours there. 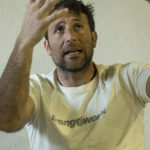 It cleared up completely and I continued, arriving at 10PM, encouraged by good weather and knowing that two other Spanish climbers (Jorge and Alberto) had made it up from C3 in previous years." "Up from C3, there were some wands (flags) and some more fixed ropes. There was deep snow shortly beneath the Shoulder, but once on the Shoulder I found the conditions to be very good. It seems very common now that everybody wants to get the Bottleneck fixed before climbing. This is surely more useful and safer. However, the Bottleneck is not so steep (about 50°) and it is climbable--not difficult up there, just dangerous." "From the previous report I knew that some climbers followed the traverse up there until the very end on the rocks and I think this is still the best solution going up there. Up there it was windy. I was very scared about the serac and the weather. I climbed as fast as possible hoping to avoid getting caught in the fog on my way back. There was really no time to enjoy the moment." "By coming down beneath the shoulder I had poor visibility that slowed me down. Clouds cleared up again and I proceeded to C3 were I rested only a little (not in my tent and I knew that the rest of the team would make an other attempt). So, I put down the tent again in order to avoid getting it swept away by the wind. I also left my gear in the tent, from C3 down there is a fixed line all the way down to ABC, so no ice axes were needed there." "Lines got slighlty frozen during nighttime and it was not always easy to clip in the ascender. Below C1 I went off the fixed lines and I proceeded down the couloir left of Abruzzi. I had done this snow-free coloir twice before. This couloir of rocks and scree is left to the Abruzzi fixed lines to C1. It's terrible to climb up there (loose scree and rocks) but good and sheltered against rockfall coming down." "I fell asleep there at about 5,600 meters. At early morning I woke up and continued to BC." Finally, Christian stated: "I couldn't really understand Gheorghe's first email mentioning he would 'create a story' against me. I thought it may be a blackmail attempt." "This situation reminds me about previous stories like Jorge Egocheaga or even Oh Eun-Sun: Someone questions you and the story goes on. Even publishing summits pics doesn´t help, there will be always someone who will have doubts. I will stop here with publishing any further reports or details. I am not interested in quarreling around thus getting more upset. Not even on public web platforms nor anywhere else." 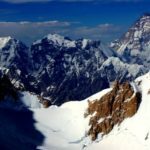 "Since I have gotten several blackmails and threats from some people of the climbers' community I hereby state that I am not willing to discuss and much less defend summiting K2." "Furthermore, for me it is of no importance to be on any of the 'summiters' lists'. Just want to remind everyone that web platforms are not considered being in court. If climbing 8,000-meter-plus peaks (and only there) includes experiencing all the bad rumours and threats I have had to endure since summiting K2, I don't want to be a member of this 'climbing community' anymore." "I know very well who started spreading the rumours or stories--I just refer to the book of Michael Kodas HighCrime. I am not climbing for anybody else but me." Christian Stangl is an experienced high-altitude speed climber with a right to be upset about the aggressive attacks on some climbing boards. Yet false summit claims have been a real problem in Himalaya, watering out both the difficulty of the challenge and the accomplishments of skilled mountaineers. The self-policing that the community has commenced in later years is not always just but nevertheless important. It is unfortunate that Christian has chosen to not follow through on his summit evidence, and surprising that the original summit image and GPS data have not been submitted. There are no witnesses to the climb, nor to any traces from the ascent. AdventureStats can not validate his K2 summit. Kazakh climber Maxut Zhumayev on K2 some days ago.